← Day 69: Get Mink Eyelashes. Day 70: Get Hot Pink Streaks. Gentlemen prefer blondes with pink streaks. My recent case of spring fever (okay, early mid-life crisis) continued to blossom right into the hair salon. I’ve been going to see my bestest hair stylist and colourist, Reni, for, like, ever, and, today, we decided to shake things up a bit and gave me a couple of hot pink streaks on one side of my head, because, well, why the heck not. 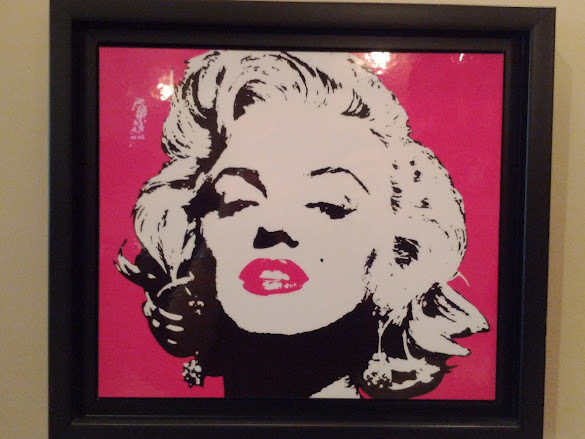 I mean, I looked up and saw Marilyn sultrily pouting back at me, almost taunting to see if I had the kahunas. You know what, doll face? Challenge accepted! Tinfoil. Not just for anti-conspiracy hats any longer. In France, I had seen several confident women older than myself with colourful sections interspersed amidst their coiffes, and they just struck me as so chic, but with a certain sassy edge… well, what’s not to like? Besides, it’s just hair. It’ll grow out… Eventually. And almost certainly by the time I decide to put this delightful life of leisure back on hold once again. So away we went, further down the rabbit hole, all the way under the hot air dryer, just like in Steel Magnolias or Sleeping With the Enemy, except with a lot less Julia. 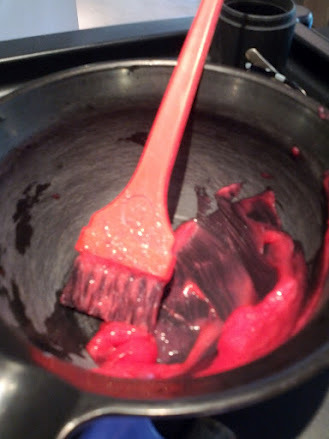 The first step in the process involved bleaching the chunks of my hair that would be so lucky as to receive the hot pink colour, to maximize its vibrancy. Excellent! No going back now… A short stint under the dome was superseded by the sublime shampoo and scalp massage, which is always the highlight of the salon experience for me. Pure bliss! And then, it was time. Bring on the Pretty Flamingo hair dye, which just so happened to be almost a perfect match for my Strawberry Margarita toenail polish. I’m thinking whoever came up with the names for these colours was drinking a pretty potent batch at the time, and I’d like to know where I can apply for that job!?!? It was at this delicate point in the process that I decided to ask my girl Reni a few questions, because, well, better late than never, right? The name of the product line was Fudge Paintbox. 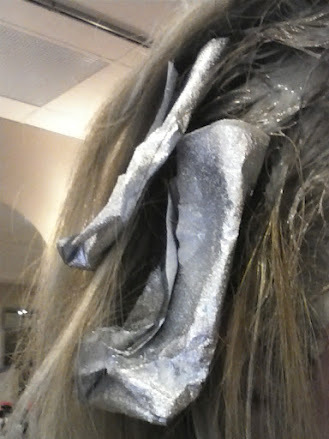 That’s right, she was packing the tinfoil on my head with Fudge, which is apparently available in a rainbow of completely unnatural shades, including Blue Velvet, Raspberry Beret, Green Envy, Cherry Bomb, and Gold Finger. I couldn’t help but giggle, and completely forgot the rest of my questions. Just like paint by numbers. Only different. I then spent more quality time with the hot air dome, and, before I knew it, it was time for another rinse, followed by the big reveal. Sweet mother of gawd! 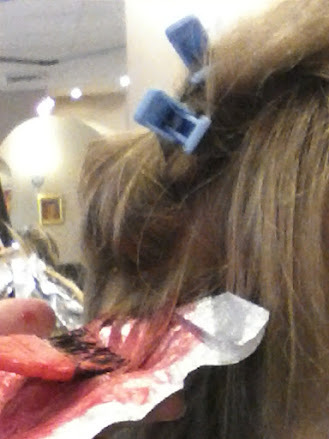 Even soaking wet, there was no mistaking the fact that the pink in my hair was hot! At which point, Reni breathed a teensy sigh of relief, and confessed that it was actually the first time she had used that particular product line, and thanked me for being her guinea pig. Doh! Fair enough, I should have asked. Ah well, she’s awesome with colour, so I wouldn’t have worried anyway… Much. Finally, we moved back to her chair for a phenomenal cut and blow dry, and I must say, I am thrilled with the results! I needed a little oomph, and this more than delivered. The best part? Walking down the street afterwards, taking the subway, and meeting up with a few people that I knew. Sure, there were a few gawks along the way, but mostly, there was respect, and even a little extra cushion of safety distance for all the crazy that clearly surrounded my hair. Oh, this is gonna be good… It kinda makes me wanna shout, and kick my heels up! But not necessarily in that order, because, you know, I gotta be me. 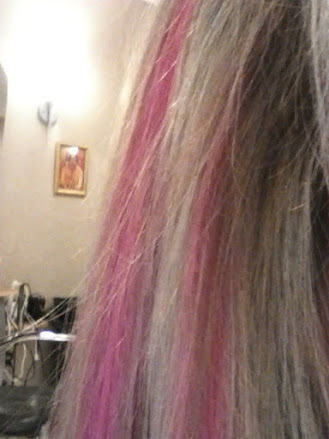 This entry was posted in Fun and Crazy and tagged colourist, Crazy, Fun, Hair dresser, Hair Stylist, highlights, hot pink streaks, May, Reni Gisondi, Salon Vivace, Toronto. Bookmark the permalink. 2 Responses to Day 70: Get Hot Pink Streaks.